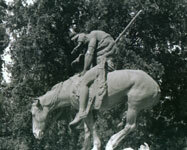 End Of The Trail statue, Visalia. Photo: Bob Dawson/ Farewell, Promised Land Project, 1995. Towns offered bounty hunters cash for every head or scalp that was obtained. Expedition expenses were often reimbursed by the state and federal governments. Rewards ranged from five dollars for every severed head in Shasta in 1855 to twenty-five cents for a scalp in Honey Lake in 1863. In both 1851 and 1852 the new American state of California paid out one million dollars respectively – revenue from the gold fields – to those who hunted Indians. In 1857 the state issued 400,000 in bonds to pay the expedition expenses of the militia. Such codes had a devastating effect. A. J. Bledsoe, a historian of the time, counted over 50 settlements destroyed in this region between 1855 and 1863. More recent historians like Sherburne Cook have examined Bledsoe’s figures, compared them with archaeological evidence to arrive at an estimate that as many as 150 settlements may have been destroyed. Both the state of California and the federal government wanted to encourage the settlement of the west, protection of new settlers and the extraction of minerals. While these policies, per se, did not promote the extermination of indigenous peoples, the impact of such policies encouraged their slow, but sure, decimation. As we will see in the next section, the cruel reality of the racist attitudes in the media and general population resulted in deliberate massacres. This entry was posted in Discover, Native American and tagged 1850s, beheading, bounty hunter, crimes, extermination, genocide, government paid for genocide, indigenous, mistreatment of law, native americans, racist, scalp, Treaties, unlawful. Bookmark the permalink.